The Mac Robotics Blog: Eagle 5.0.0 for OSX. No X11 required!! A Mac user, electronic hobbyist community blog, concerned in bringing robot design tools to the Macintosh. Eagle 5.0.0 for OSX. No X11 required!! O HAPPY DAY! The good guys at CadSoft have heard the clamor of the Mac-using hackers. 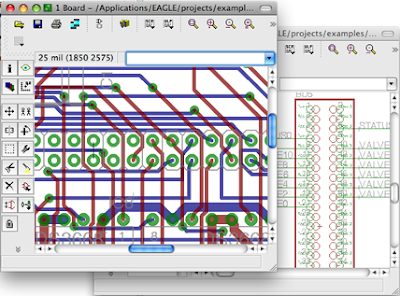 The new 5.0 version of their excellent Eagle PCB design software not only runs in OSX, but it also runs Aqua style! To check out the droolworthy software, follow the link. Note: there's an excellent Eagle tutorial in Sparkfun.com. Link. Great software with profound features!Great software with profound features!Thanks for keeping us update..